Long ago, there lived a wolf in a dense forest. The forest was surrounded by hills and gorges. A small river flowed through it. Once the wolf was drinking water at the head of a stream, when he saw a lamb drinking water from the same source down at some distance. 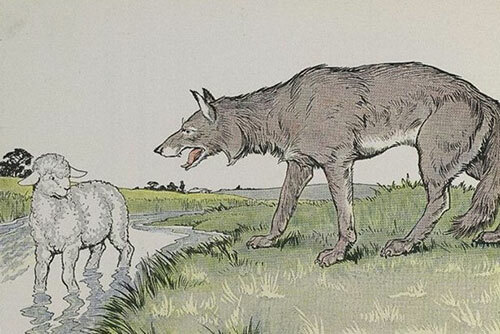 The cunning wolf began to think of an excuse for attacking the gentle lamb and eating him. So he shouted down at the lamb, "How dare you make the water dirty I am drinking?" "You must be mistaken, sir," said the poor lamb gently. "How can I be making your water dirty, since it flows from you to me and not from me to you?" The wolf. began thinking cunningly of some other ruse in order to make an issue and get a justifiable excuse to kill the lamb and eat his delicious flesh. "Do you remember having applied all sorts of contemptuous and even abusive epithets to me, just a year ago?" said the wolf to the innocent lamb. "But, sir," replied the lamb in a trembling voice, "I wasn't even born a year ago." "At the most, I can apologise on behalf of my erring father if he at all ever did so," pleaded the lamb trembling. "I think you're the kind of fellow who first commits a sin and then tries to argue it out. Let me teach you and your family a good lesson", saying this the wolf jumped upon the poor lamb and tore it to pieces and ate it.